From FEBRUARY 11 – MARCH 12, we challenge you to complete 25 mental, physical, and “feel-good” sessions in 30 days. 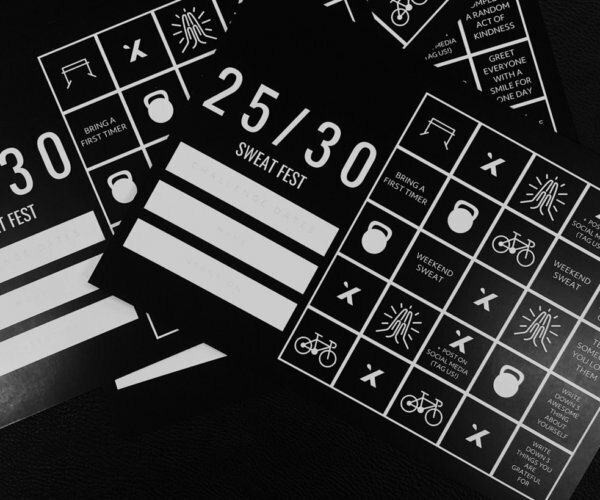 Following our October Sweat Fest last fall, we’ve put a bit of a twist on our challenge cards for this round. We changed out 5 challenge boxes that are going to challenge you outside of the studio. Warriors that accept and participate in the challenge will get hooked up with exclusive Sweat Fest merchandise. Warriors who successfully COMPLETE the 25/30 challenge card will be entered in a draw for a chance to win 1 of 5 prizes worth over $700. Also included in this challenge: themed classes, themed playlysts, alot of sweat, a community that feels like family, + all the good vibes. On a class package? Joining this challenge gives you UNLIMITED access to classes for the entire 30 days! There are only 50 spots available for February Sweat Fest. We had over 70 participants last challenge, so don’t wait till it’s too late to secure your spot! To purchase your ticket: email info@xtherapy.co, or call the studio 780-905-9897.